The Bulletin of Atomic Scientists announced yesterday that the Doomsday Clock remains at 3 Minutes to Midnight - the closest it has been to catastrophe since 1983 – at the height of the Cold War. "The Doomsday Clock reminds us, as global citizens the urgent need to prevent, reduce and eventually rid the world of nuclear weapons" says PNND Co-president Paul Dewar (Canada). The Clock was established in 1947 to measure how close humanity is to destruction by nuclear war. In the past few years the threat of planetary destruction from climate change has been added to the nuclear threat to determine the position of the clock’s hands. The announcement comes just two days before the first session of the UN Open Ended Working Group on nuclear disarmament (OEWG), which has been tasked to discuss legal measures to achieve a nuclear-weapon-free world. It will also consider interim measures to eliminate the risk of accidental, mistaken, unauthorized or intentional nuclear weapon detonations. It is expected that Ambassador Thani Thongphakdi of Thailand will be appointed as OEWG Chair . UNFOLD ZERO has launched a competition to find an effective campaign to support the OEWG. See UN OEWG - win a trip to Geneva. PNND, Mayors for Peace and Religions for Peace are gathering further endorsements on the Joint Statement of Legislators and Religious Leaders for a Nuclear Weapon Free World and plan to present it to the OEWG in late February to encourage constructive action by the participating governments. Send endorsements to alyn@pnnd.org. 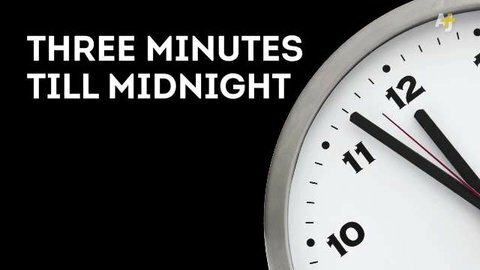 For more information see Doomsday Clock: It’s still three minutes to midnight – PNND responds and Recent Actions to Support the OEWG. Parliamentarians for Nuclear Non-Proliferation and Disarmament (PNND) is a global network of legislators working on a range of initiatives to prevent nuclear proliferation and to achieve a nuclear weapons free world.